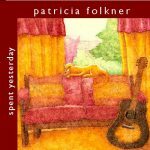 Patricia Folkner Daley, of Boise, Idaho, is an accomplished guitarist/singer who blends jazz and folk into her own unique style and sound—a sound that keeps listeners engrossed. She’s a guitarist, not just a player; and her vocals….clear and beautiful. Pat is the antithesis of the raw, edgy, angst-ridden singer/songwriter. Her playing and singing can be summed up as “smooth and sophisticated”, and, as many a fan has stated, she’s “very, very easy on the ears”. In 2016, Pat teamed up with jazz bassist and vocalist extraordinaire, Peggy Jordan. The resulting creation, Mood Swing, is a smooth, jazzy, bluesy Boise duo whose signature sound and irresistible groove always packs the house. Pat has been playing guitar, singing, and writing songs since age 11. 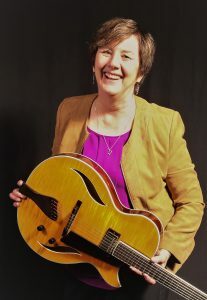 She has many years of experience playing in numerous venues around Boise. As well as being a performer, she is the mother of four grown children, and is currently a guitar instructor in east Boise. Expect: folk covers from the likes of Nanci Griffith, Mary Chapin-Carpenter, & David Wilcox. Expect jazz tunes by Irving Berlin, Harry Connick Jr. and others. Expect, in general, a mellow beautiful sound that your guests will really appreciate!! Please visit the bookings page. Listen to song samples.